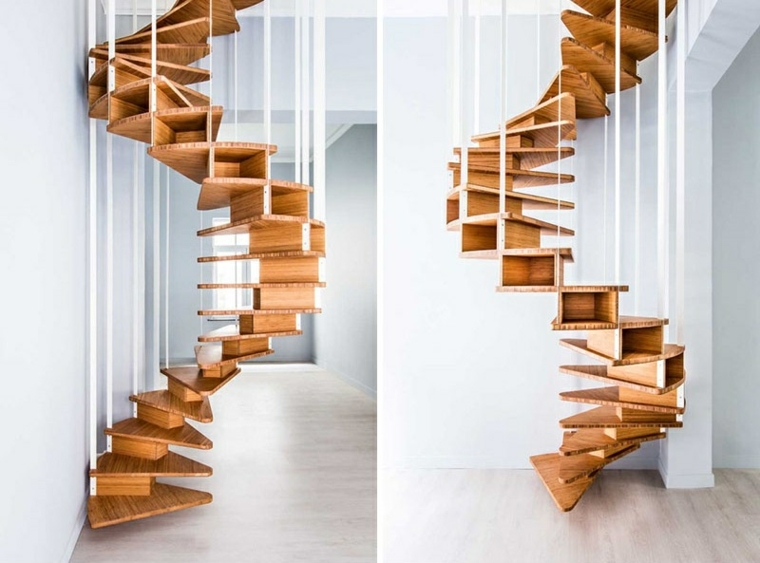 The staircase designs are something more than a simple element that connects different heights. Much more. In addition, they can even become the decorative epicenter of our house with just a few steps and a lot of originality and design. There are many different styles of stair designs, different materials, and shapes, as well as sizes. 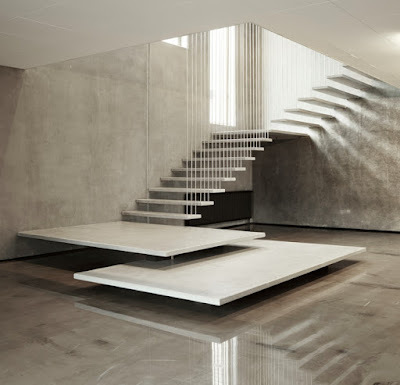 When you have a house with two floors, the solution to go up to the second floor is one of the decisions that must be taken into account, in the execution of the project, the type of staircase design ideas, the style, the materials to be used, everything depends on the space with accounts and the style of your house. 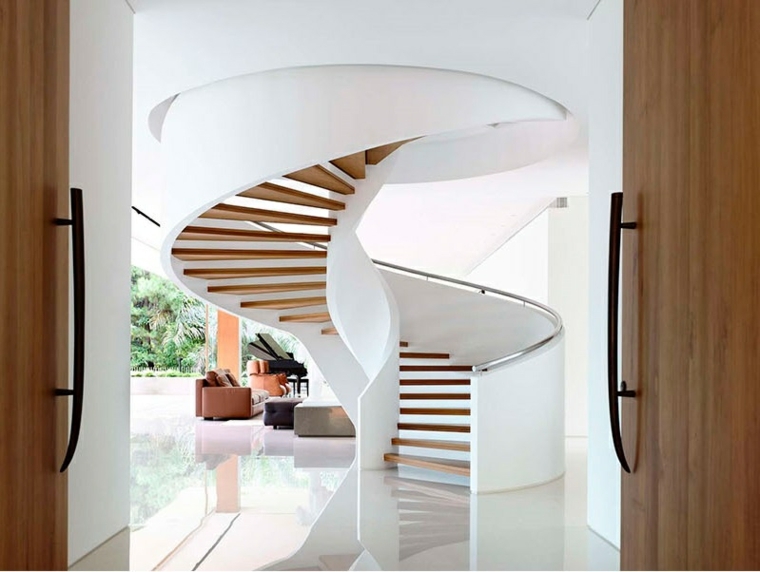 If you have enough space, modern stairs designs with two branches, or straight, if space is small, a spiral staircase or helical, is what you need. The designers of the modern staircase ideas are struggling for the reliability of the structures and tend to make them invisible to create the feeling that we did not climb the stairs, but just soared up. We will see different designs of stairs that range from modern stairs, classic, utilitarian, to rustic designs that can go very well in some spaces both internal and external to the house. You will also have the necessary notions to the modern staircase design and stair railing and handrails of your home and choose the shape and style that perfectly suits what you are looking for. There are more than a dozen forms of stairs, but we will mention the most used for housing both inside and outside of it. Stairs in the shape of "U"
staircase in the shape of "L"
Each type of staircase has different parameters for the design, for example in some cases it requires a rest stop, however, in cases of circular or oblique stairs the step is continuous in most cases. A standard measure is 29 cm for the step (where we place the foot) and 17 cm for the counter (height of each step). It must be borne in mind that these measures can change according to the height of the ceiling of the house, by example in the spiral staircase design these measures are reduced to be able to turn comfortably. 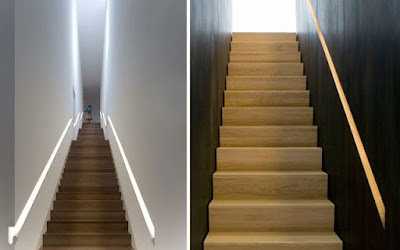 The style depends a lot on the design of the house, the elements such as the stair handrail, steps and counterbalances can be for example the material and color of the walls, if you use the wood in your house recursively these same elements should be applied to the modern staircase design. Do not worry about the images that we will see in this article you will be able to have ideas to choose from, be it a contemporary staircase, rustic, classic or even artistic model for what you are looking for something out of the ordinary. The options are various from the structure to the prefabricated in materials diversity. There are many variants with varying amplitude that can even be regulated. All in function of adapting to the space we have for it. Interior staircase design ideas are many. So it is common that we do not know where to start. From here we are going to give you some clues to find the ideal stair design. 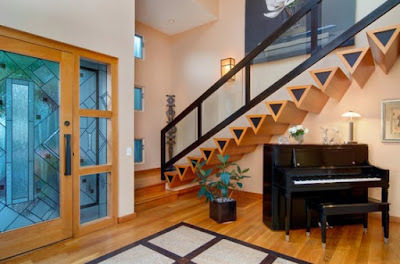 The stairs design ideas can be grouped into different styles. 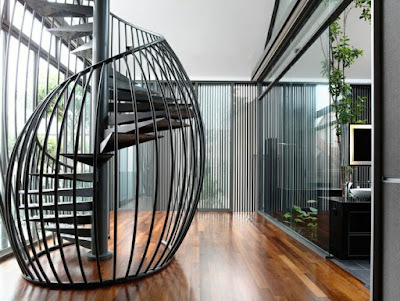 Spiral staircase design, retractable, straight lines or U shaped. The first thing to select the right one is to know the place where you will install. Study the area carefully and think about how it will be used. This way we can make a choice that in the end does not disappoint us. Interior staircase ideas and the design that is chosen should allow spaces to communicate. Are you thinking of remodeling the house and want to change the interior stairs design? Designing a staircase is a challenge. To do that you have to have a lot of parameters in mind. Design, dimensions, use of space, materials, how it adapts to decoration, and so on. In addition, security and functionality are two fundamental elements to consider. Therefore, today we will talk about some tips for designing stairs. You must bear in mind that a well-designed staircase design must have at least 80 cm. wide and an angle less than 42º. In case you want a hanging structure (with steps attached to a single wall), it must have handrails on both sides if it is wider than 1 meter. In terms of materials, modern stair designs use both metal and glass. 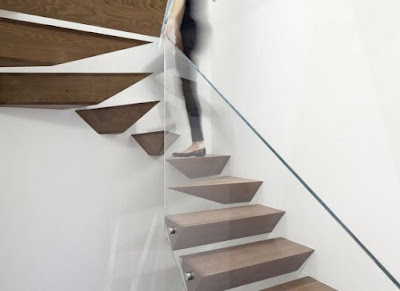 In some cases, the steps are glass and metal, with a very light aesthetic appearance. They are typical of modern houses or interior design minimalist style. In addition to the material and style, you can consider the design of spiral stairs that can be ideal for places with little space. 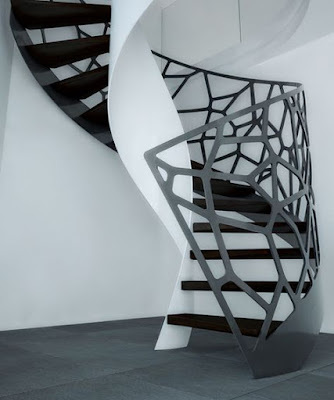 The helical design allows you to decorate spiral stairs in various ways. On the contrary, I can tell you that they do not allow you to transport large objects from one level to another. Also, if you have limited space, you can choose a modern staircase design of multifunctional stairs that allow you to store things under them and even try some options that allow you to deposit things inside drawers in the steps themselves. We have to take into account several factors. One of these is the dimensions of the place we have for its placement. Regarding this last aspect, there are two variants. If you have little space available in the room, you will have to use the walls obligatorily. However, if you have more meters and can afford it then you can go more towards the center of the room. If the height is low, access to the second level will be faster and therefore you will need fewer steps so I recommend a modern staircase without breaks. If the height of the room that determines the next level is larger, then it will be necessary to make a staircase breaks, as it is ideal since the access and passage from one level to another will be much more comfortable. We will have a clearer idea of starting at the installation site. Today's post is dedicated to the interior stairs so the materials are many. Starting with a true classic that is wood. Using wood on the inside stairs design ideas with any style brings warmth. Much difference space in this detail for its great decorative effect. In several staircase design ideas, we see styles with a metallic finish. A perfect material that is similarly very decorative. 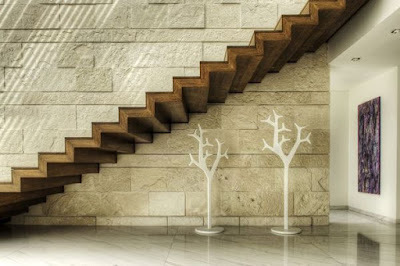 If you are looking for a modern staircase design style it is a good idea to combine wood and metal. The other detail to take into account obviously is the space. When it comes to small space or the entrance we start with the spiral stair designs. 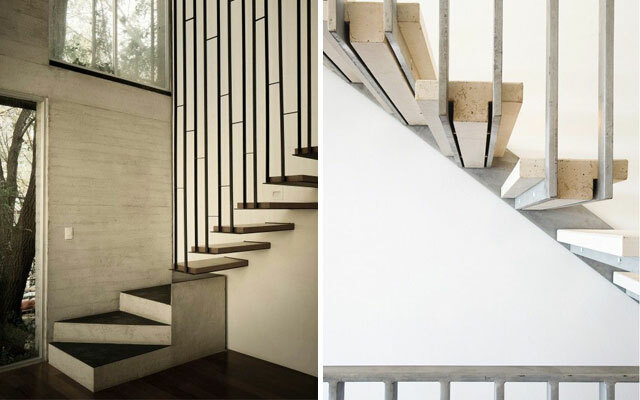 For those lucky enough to live in a duplex, loft, chalet or multi-story detached house, today we propose a very special way to give a touch of design to your modern staircase: focus on the stair handrail. The element usually forgotten in the stair designs, the latest trends offer modern stair handrails ideas that will make our staircase look spectacular. 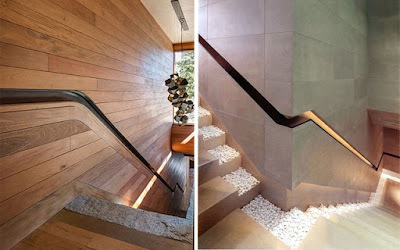 The stair handrail design is one of the defining elements of a staircase. The usual thing is that it consists of a more or less conventional handrail that is supported both at the ends and along the stairway by several vertical bars. It is, therefore, an element not only aesthetic but practical, which helps us to support ourselves while climbing the stairs, either because we have sprained ourselves because we have elderly people at home or for simple comfort. This type of modern staircase designs with handrails "embedded" in the walls that flank the staircase allow us to generate a very attractive and modern point of attention. Whether in stone, wood, metal or in a combination of them, they are also the perfect candidates to apply LED indirect lighting as we will see in the next section. We have already commented on more than one occasion how light, wherever it is used, decorates any space by itself and the LED stair lighting was not going to be an exception. The designs of backlit handrails give a very dynamic character to this space, getting a perfect LED indirect light for its route, acting additionally as orientation light that marks the way. Another way to give originality to our staircase is to focus on the shape of the stair handrail design. Currently, these types of designs are very popular due to their attractiveness and originality, and they do not always mean a high cost of the project, as it allows us to reuse pieces or remaining material from the construction of the staircase. 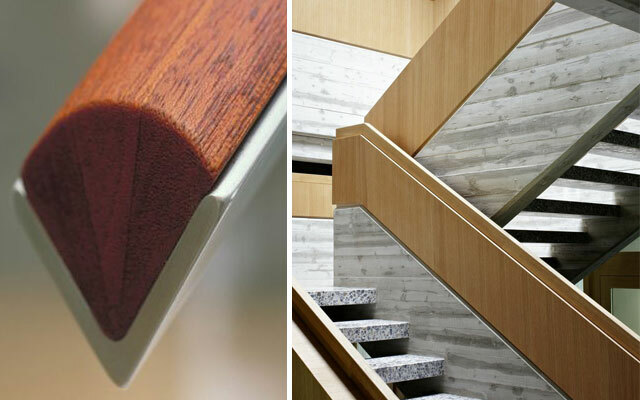 When the stair handrail design goes whole in the same material without joints, the finish is homogeneous and generates a very powerful decorative impact. We can also combine pieces and small sections of different materials, which gives a very interesting appearance. Classic material among the classics, wood offers infinite shapes and applications to interior design. The repetition has always been an ally of the design and the wood lends itself especially to it, guaranteeing us always warm finishes and a constructive resistance at prices for all pockets according to the chosen quality. Undoubtedly the most pointer in the design of this type of elements is linked to materials that allow us to generate organic designs. Although in this sense the Corian is the king, there are nevertheless other materials that lend themselves to it, such as wood slats, plastic, and even certain steels or aluminum. 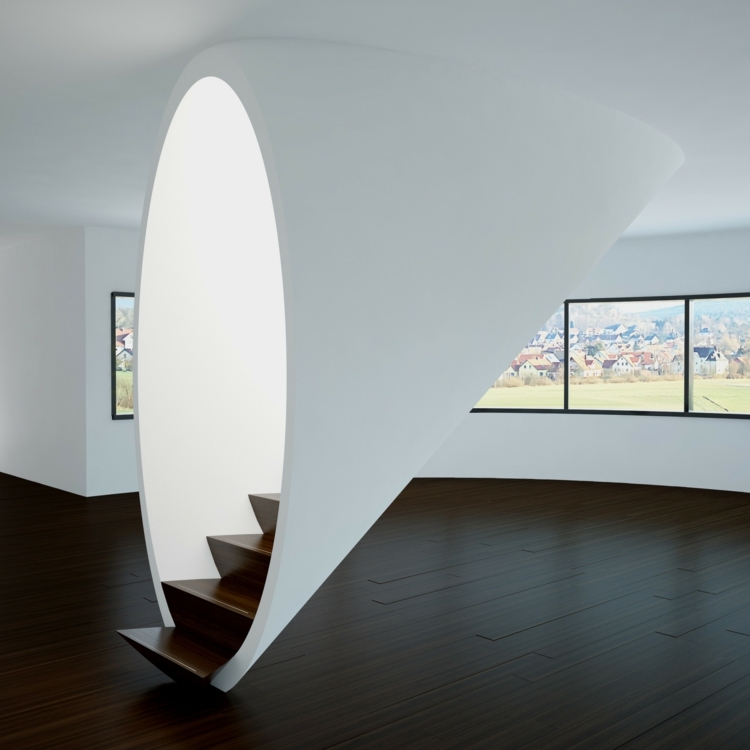 In interior design, modern spiral staircase design is one of the popular options. There is a great variety of versions and styles. It is a point in your favor when selecting a design for your home. The spiral staircase design ideas are also the best when it comes to small or narrow spaces. As we see in the images this does not mean that they do not look perfect in larger environments. In this case, we have the possibility to take advantage of the sculptural effect they offer. It can be converted into a detail of great aesthetics and with an artistic touch for our interior. So we propose to give you some keys to select yours. At the moment of selecting the spiral stairs designs, the main thing will be the space. In the images, we show its use in interior spaces. However, there is always the possibility of using them abroad. 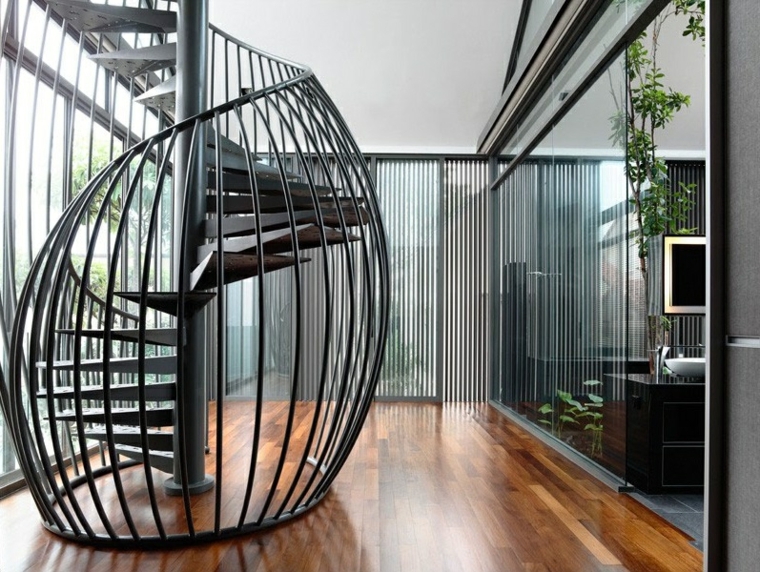 Under these conditions, the spiral stairs must have resistant materials. The steel stainless is one of those solutions like other metals with treatment. This way they will be able to resist the effect of the rain or the changes in temperature without problems. As we mentioned, they are one of the favorite solutions for places where the use of another type of staircase designs is impossible. 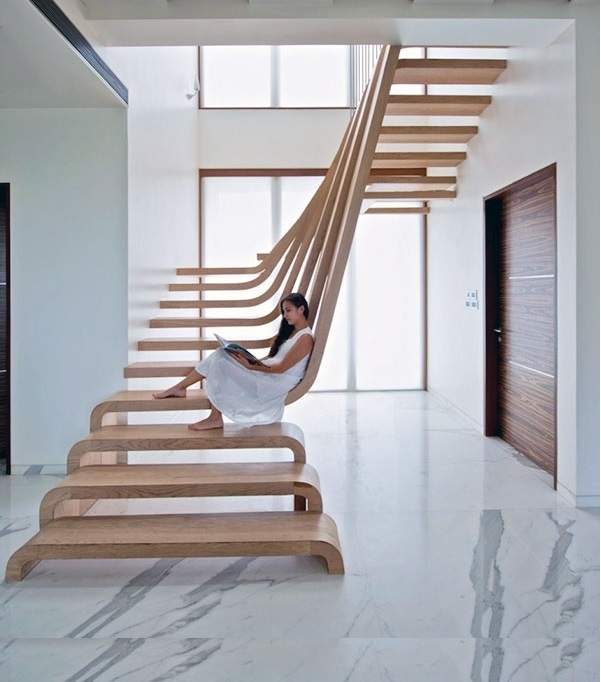 Think first of all about the comfort and functional aspect of your modern staircase design. Assess the use and what is needed for the spiral stairs designs. Remember that it is something that we will use frequently, so in addition to being comfortable, it should look in harmony with the rest of the elements. An adequate width and steps of a specific height are some of the things that we should not overlook. 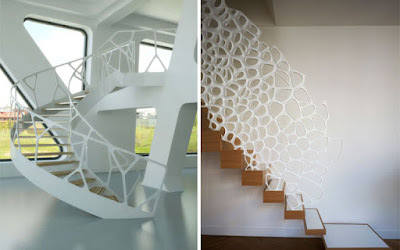 Another important point, especially for interiors, is the style of the staircase and its aesthetics in general. 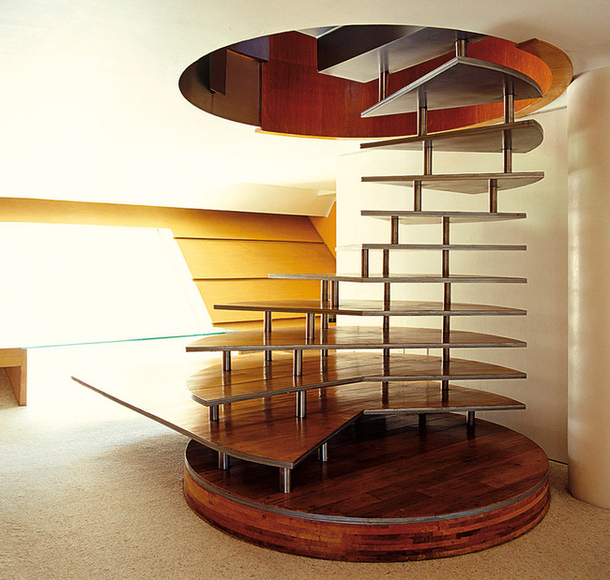 They are a type of spiral stairs designs that visually are of great impact. Which makes many sites become the visual accent par excellence. 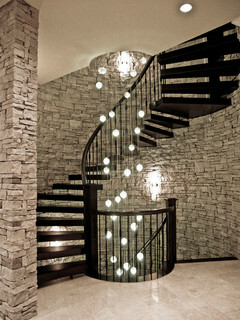 A spiral staircase design will look perfect when it comes to environments with mixed styles. Like the designs that combine several materials. 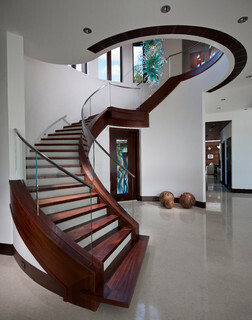 It is precisely in these cases where the modern staircase completes all the style giving it personality. If you intend to create an air of exclusivity in the same way the impact of the staircase will be perfect. The contrasts, material, and colors are aspects that can help make it stand out. For a modern staircase design that is intended to be integrated into a more harmonious environment, it is best to use soft colors. Like materials, everything must be based on the simplicity of the forms. If it is about the interior, the wood has a fairly widespread use. It is a durable material when it has the appropriate treatment. In the same way, its warm effect on the overall environment makes it very special. At the other end would be the metal ones if you prefer a more modern cut environment. Both materials combined in the same way will look perfect in many interiors. Finally yet importantly least in the selection is the aspect of security. This can not be overlooked and you should always pay attention to the stability of this type of spiral staircase design. The materials must be anti-slip especially when it comes to outdoor accesses such as terraces. A suitable stair handrail design, in the same way, cannot be missing and in this the location of the staircase is essential. The staircase railing must occupy the whole spiral staircase structure to avoid falls and increase our security. In the case of rope handrail, it can be used to complement another type of railings with a great design. 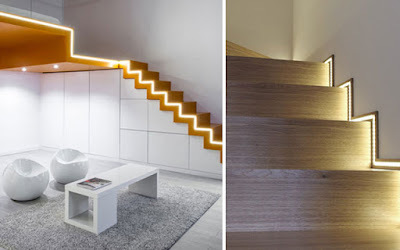 We end the post with ideas to decorate home with LED stair lighting. that if you have a loft, a two-story duplex or a multi-story room, staircase LED lighting is the best way to give a touch of design without needing to decorate anything more. Currently LED technology has made it much easier to install lighting in any interior element, also improving its aesthetics. 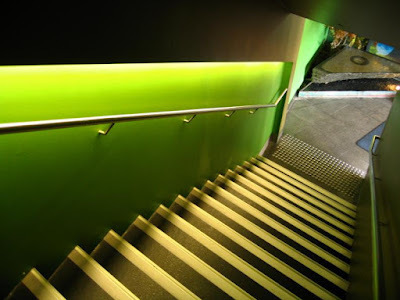 Although LEDs have been a trend for some years, they are still in the development phase and the future is undoubtedly theirs, since their efficiency, durability and lower consumption also work very well both in public places and in homes and the staircase lends itself as No other element to this type of technology since the area of passage needs more guidance light than general lighting. In addition, both its longitudinal shape and its low height make it the natural habitat for LED strips. Despite this, LEDs are not the only way to get decorative stair lighting ideas. Recessed, surface, indirect or manual luminaries are different options used in both interior and exterior, commercial or residential projects. Below we will see some examples for you to see the different techniques of integration of electrical systems, as well as the different types of colors and color temperatures you can choose to inspire you. Let's go there!